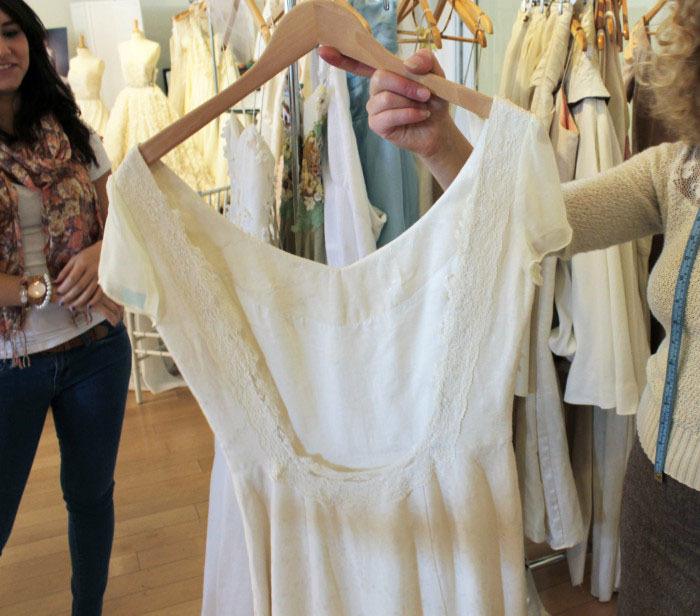 “Love, music, trees, water, moss, color, texture”–are some of the things that inspire Tara Lynn Scheidet, a Vermont-based designer of her label, Tara Lynn Bridal. With her halo of blond waves (she promptly declared that despite her coloring, she’s Italian; I offered that my best friend is also Italian and fair) and a warm smile, Tara Lynn the person exudes the unabashed optimism and romanticism embodied by Tara Lynn the collection. Her line is defined so clearly by the core values of sustainability, love of nature, and appreciation for beauty–which are not unrelated parts, but completely and organically connected as a whole. I searched a while for the right word to describe this and it suddenly struck me that it’s authenticity–often tossed-about, but so rarely observed in reality. Tara Lynn knew she wanted to become a fashion designer at age 14, when she started making her own clothes. She went on to study at FIT, where she discovered yoga, holistic living, and environmental activism. While working as design assistant, she became disillusioned with the conventional retail industry, which uses harmful chemicals to produce, dye, and treat fabrics, not to mention the issue of worker conditions overseas. 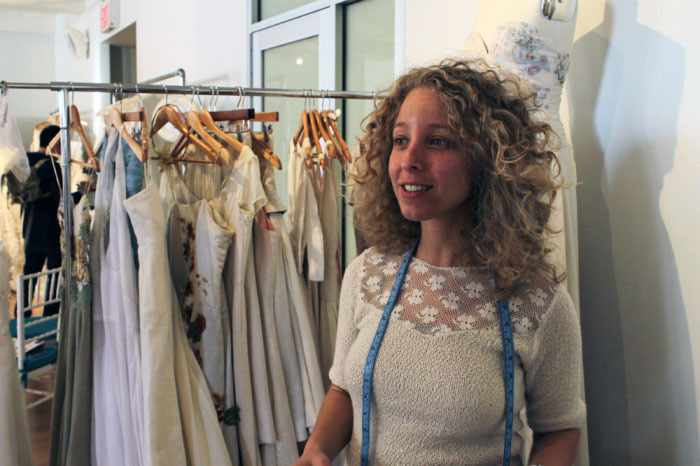 Tara Lynn began collecting and making her own clothes using organic hemp and cotton. Her first pieces were tailored jackets made of repurposed materials, and to this day jackets remain a big part of her signature. 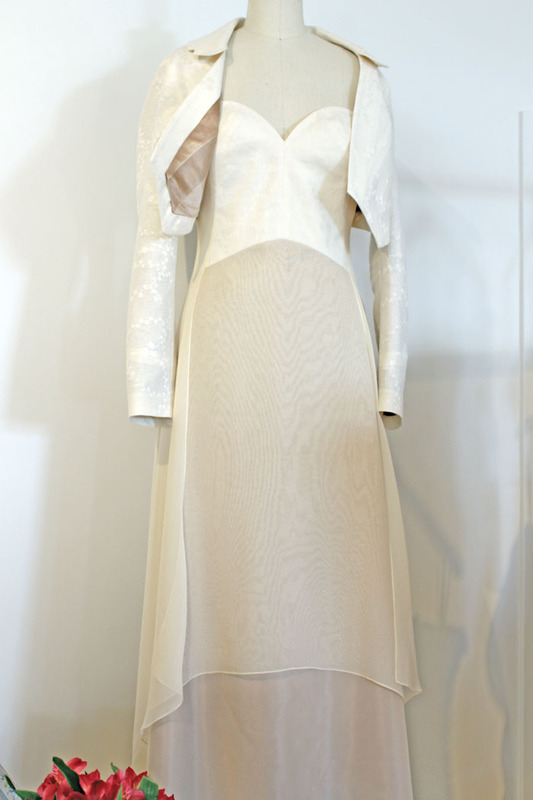 Hemp and silk blend “Bolero,” worn over “Sylvania,” a hemp and silk blend princess seam gown. After college, Tara Lynn and her husband Evan moved up to Sutton, Vermont, where they settled in a one-room log cabin. They lived without electricity or running water for the first 5 years (cooking over a wood stove and drawing water from a well), though now Tara Lynn designs in her solar-powered, “tree house” studio on the 2nd floor that looks out over the idyllic Vermont woods. Brides flying in for fittings find themselves taking an unexpected mini vacation in lush mountains with wildflowers and even a nearby lake. “Farfalla” hangs far left. 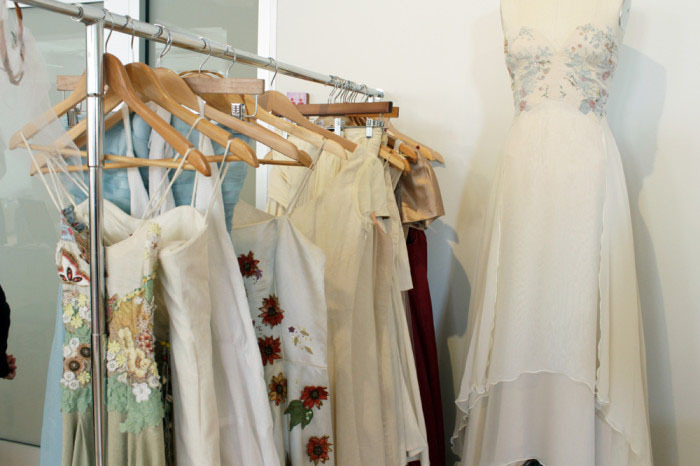 Embroidered “Sylvana” (right) is one of Tara Lynn’s favorite gowns in her Spring 2014 line. With her surroundings, it is not surprising that Tara Lynn takes inspiration from nature. 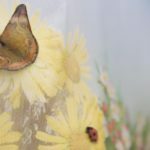 “I like to think of my pieces as wearable art,” Tara Lynn said, picking up an exuberant embroidered dress with a sage green handkerchief skirt, named “Farfalla”–Italian for butterfly. 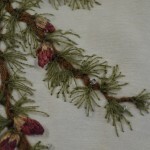 One of her favorite techniques to making wearable art is block printing. 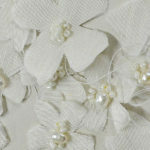 Custom applique and hand embroidery is another of her signatures, and Tara Lynn works closely with her brides to come up with one-of-a-kind motifs, often inspired by the flowers and butterflies right outside the studio. Each of her custom gowns are hand sewn from vintage fabrics and organic natural fibers, especially hemp, which she prefers because it is easier to grow, treat, and produce organically. She donates 5% of the proceeds of each collection to the preservation of a different endangered species. We asked Tara Lynn to pick some of her favorites. She’s holding Chiara, a knee-length strapless dress with embroidered bodice. 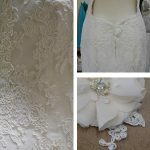 Bella, a short sleeve gown with a deep U back, is lined with vintage lace, another of Tara Lynn signatures. She has been collecting vintage trims since age 13. Click here to read the article on Peaceful Dumpling’s website.